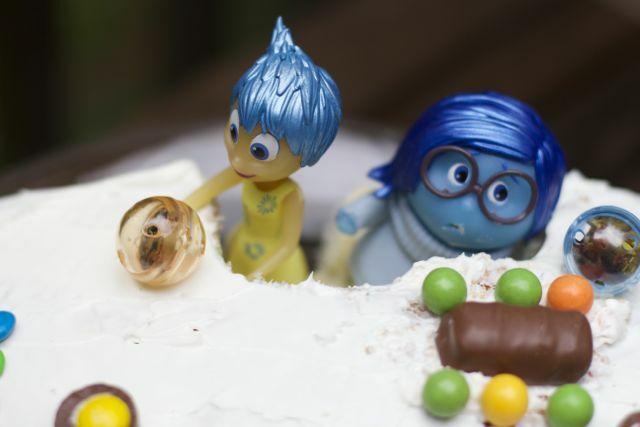 This summer, my mom took the kids and me to see Inside Out at the movie theater. All three generations truly loved the movie. This week, our family had two different parent-teacher conference days, meaning the kids were home. 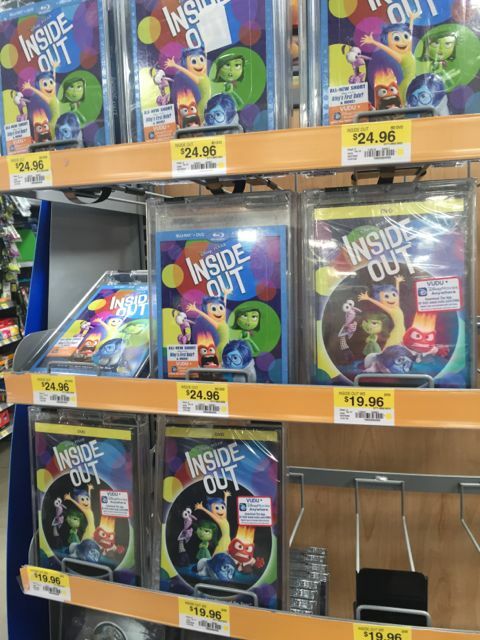 Knowing Inside Out was available for purchase, I brought my youngest son to Walmart to buy it. As you might have realized, when I bring home a new DVD, I tend to create a little themed movie viewing party too. They are simple, but make a movie night (or afternoon in this case) a more memorable experience. 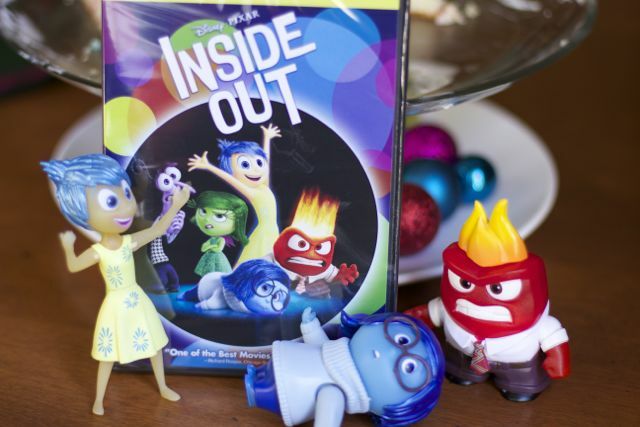 Have you picked up the Inside Out DVD yet? 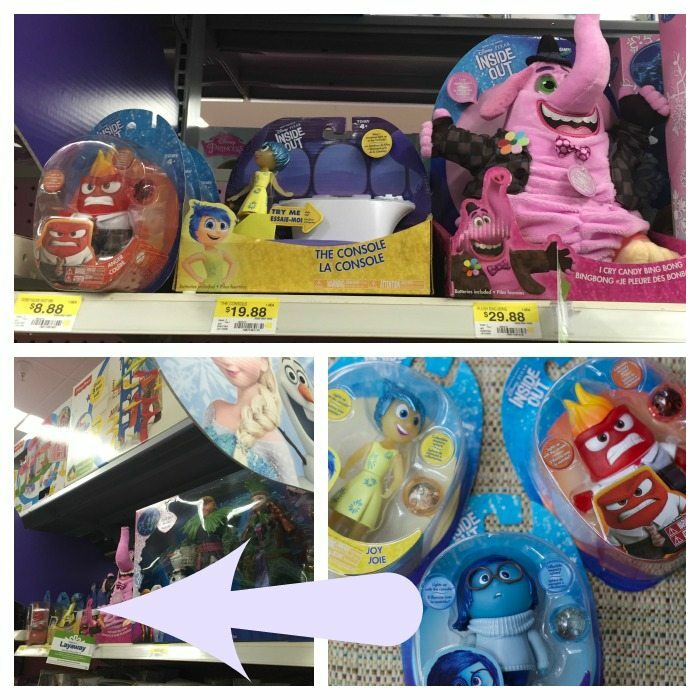 While at Walmart buying the Inside Out DVD, I also saw these adorable Inside Out Tomy toys. I almost missed them as they were tucked in with another Disney Movie. 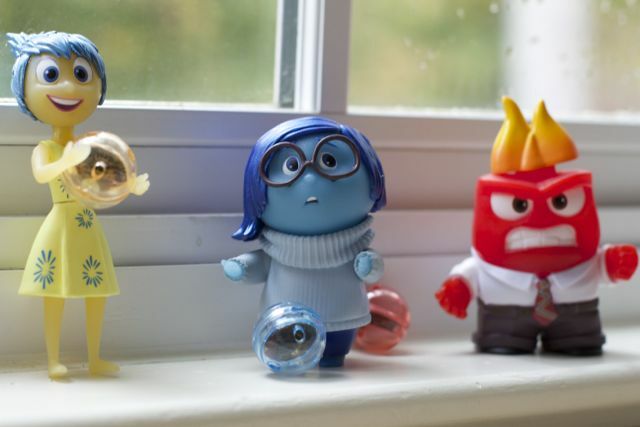 I am not sure which Inside Out emotion is my favorite, but they only had three, Joy, Anger and Sadness. No worry, I am joyful that they had these, and they will do just fine for what I have in mind for my viewing party. 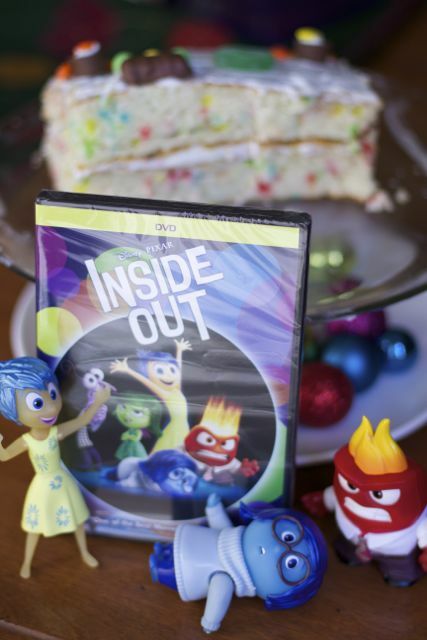 Though we’re not celebrating a birthday, we made a Inside Out emotions cake to eat while watching our new DVD. 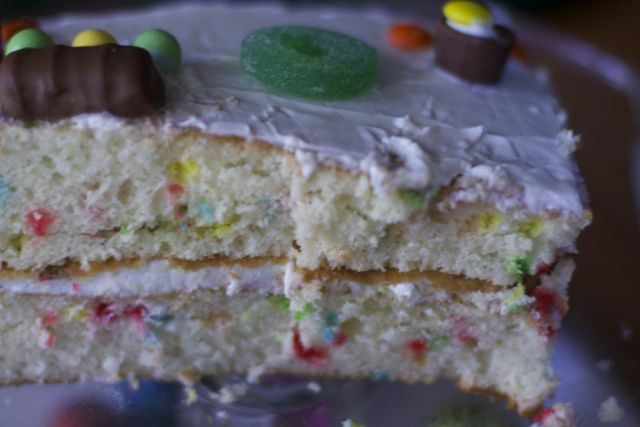 You can find the recipe for the Confetti cake here. I thought the colors were perfect to represent all the emotions in the movie. I also made the cake into two smaller rectangles to resemble the console. Don’t you think the confetti is a great touch for the emotions? Here is a different view of our console. Hope it looks similar to the movie. 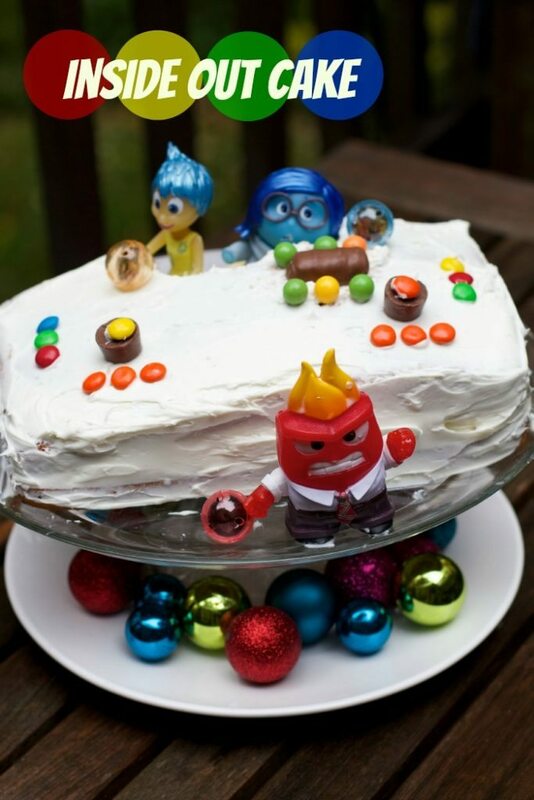 Frost the cake and then adorn with more sprinkles or controllers. 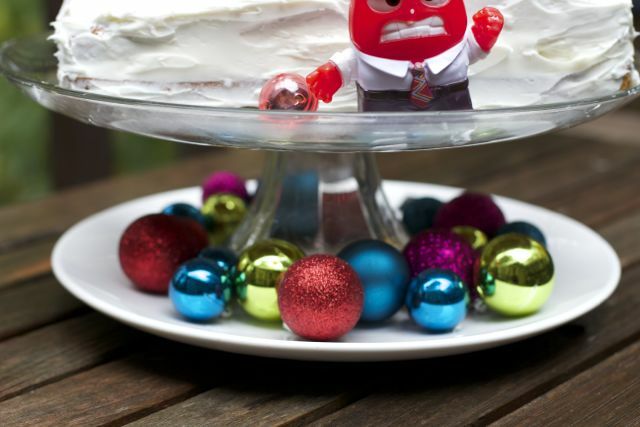 Pick up some small Christmas ornaments to spread around the bottom to represent the memories. This movie is not just for kids. As I previously mentioned, it was well received by and probably resonated best with parents and grandparents. Bring the family together and watch it over Thanksgiving. It is a great family movie that will be enjoyed by all. Be sure to pick up your copy of Inside Out at Walmart! When we went, there were not that many on the shelf…I hope they plan on restocking! I’d love to hear about your DVD watch party plans! 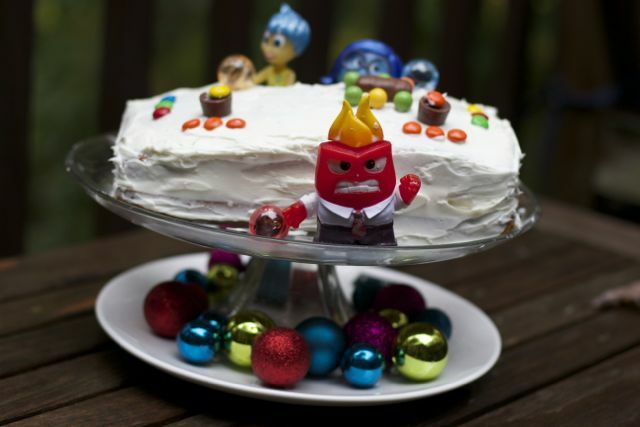 I just love all these Inside Out characters and look forward to watching the DVD several times. My husband has not seen the movie yet and excited to hear his reaction. I cried even the second time. I cried when I watched this for the second time too..
My daughter has been wanting to see Inside Out, she’s a big baby. The cake looks yummy as well! How cute is that cake? What a great idea! We haven’t seen this movie yet but I’m planning on picking it up soon. The viewing party sounds like it was a blast! 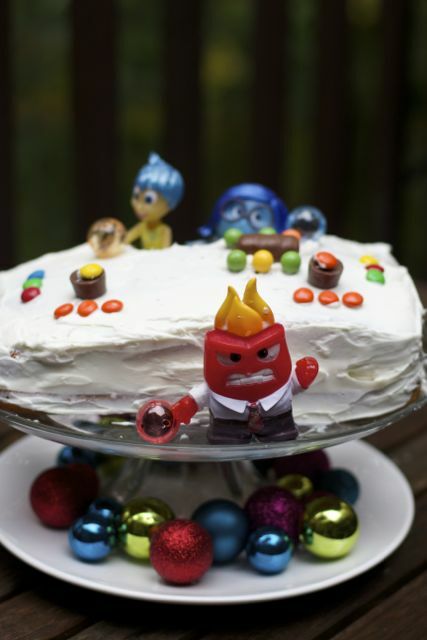 We recently had the opportunity to watch Inside Out and my daughter and I love it! She would go nuts over this cake if she saw it. 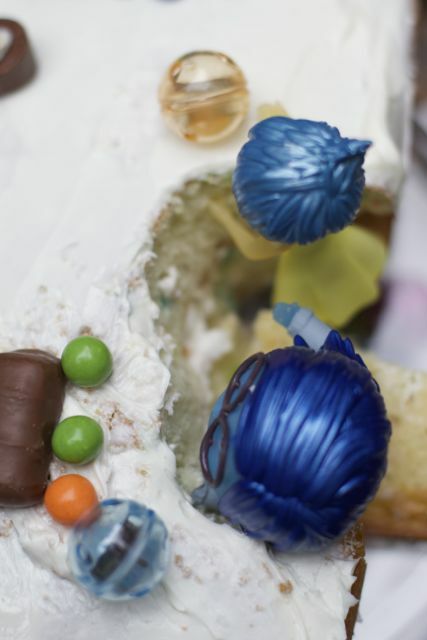 I love how you tied in the confetti cake to match all the colors of the emotions. Isn’t it great that Walmart has everything you need. Inside out was a great movie, I can’t wait to see it again. This is such a cute cake idea! We absolutely loved this movie! It is just as much for adults as it is a children’s movie!